BECKHOFF Automation supplies a new line of cost-effective EtherNet/IP bus couplers in a compact design. The Compact series bus couplers from Beckhoff have been supplemented with the new BK9055 couplers for EtherNet/IP. 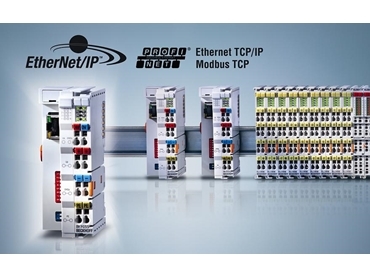 The BK9055 couples EtherNet/IP with the modular Beckhoff bus terminal system, which offers over 400 different signal types. The Compact bus coupler series is characterised by slim housings and cost-optimised design. The BK9055 Compact bus couplers allow inexpensive connection of the Beckhoff I/O system to EtherNet/IP networks.